This is a big question. It affects all of us, because all of us at some point will go through crisis. James tells us that in James 1, “consider it all joy when you go through crisis”, not if you are going to go through crisis, but when. 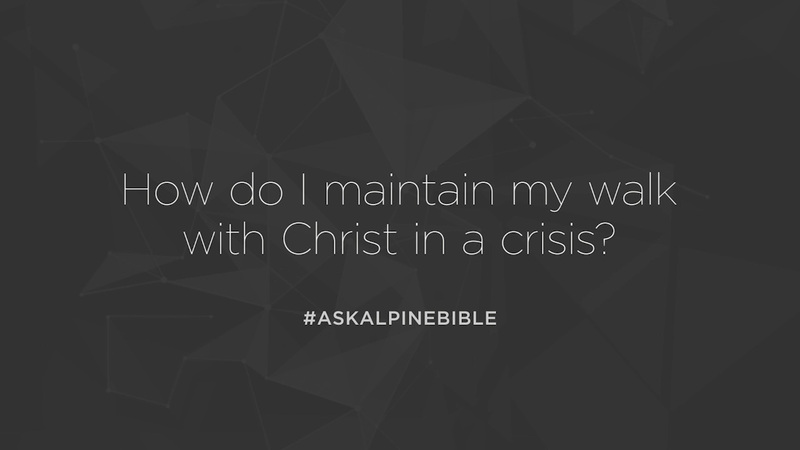 I think it comes down to three things when it comes to maintaining our walk with Christ. Not even just maintaining, but really growing our walk with Christ. First, we just need to be honest with our situation, we need to be honest with ourselves. We need to admit that we are in a crisis and we need help outside of ourselves. In Matthew 11:28, Jesus says, “come to me all you who are weary and heavy laden and I will give you rest. You can’t come to Christ for rest if you’re not willing to admit that you need the rest. In 2 Corinthians 12:9, the apostle Paul writes, “God’s grace is made perfect in our weakness. In our weakness he is made strong. So I will boast all the more in my weakness.” You can’t boast in weakness if you can’t admit that you are weak. So we need to be honest in our situation and admit that we cannot do this on our own and we need help outside of ourselves. In that honesty then we turn to what I think is the second most important thing. Scripture. God’s word. We turn to God’s word and read passages like Psalms 91, where it tells us that God is our refuge. He is our fortress, protecting us. He’s a hedge around us. When we go through crisis, whatever that may be, whether that be relationally, whether that be physically going through an ailment, we look at passages like the Psalms in honesty and say, “I need protection. I need help.” We see those scriptures, and those passages and we read them and we’re encouraged. Then we look at verses like Romans 8:28, and we’re encouraged by hearing things like, “all things work together for good for those who love God and are called according to his purpose.” We know as believers that when we go through crisis, we can count on the fact that God has promised us that eventually it will work out for his glory and for the good because we love him and are called according to his purpose. You read verses like Revelation 21:4 that tells us that in the end when Christ returns that he will wipe away every tear and there will be no more pain. No more suffering. And we can look at verses like that in our honesty, admitting that we are broken and need help. We look at those verses and we’re encouraged and we’re strengthened. The third thing that is key to maintaining your relationship with Christ during crisis, is fellowship. We need to find other believers and we need to get around them and be honest and real with them, so that they can encourage us and we can encourage them. Galatians 6:2 tells us to bear one another’s burdens. You can’t bear each others burdens if you are unwilling to bring your burdens to your friends. James 5:14 says, “if any of you is sick, call the elders in the church to come and pray for you.” If you are going through a tough time, this isn’t just limited to sickness and physical ailment, but if you are going through crisis, call the leadership of the church and ask for prayer. Let the body of Christ do what the body is called to do and help support you in that. Then you read verses like Proverbs 27:17 where iron sharpens iron, so one man sharpens another. We can’t sharpen each other if we’re not fellowshipping with each other. I think these three things are key in order to not just maintain, but really growing in our relationship with Christ. We have to be honest with our situation, admit that we’re weary and heavy laden and that we need rest and go to Christ for that rest. Turn to the scriptures and seek encouragement and strength in scriptures. Then we need to fellowship and be around other believers who are going to encourage us to turn to the scriptures and turn to Christ and really encourage us in Christ in the midst of crisis.